A Conveyor system is a common piece of mechanical handling equipment than moves material from one location to another. Conveyor are especially useful in applications involving the transportation of heavy or bulky material. Conveyor system allow quick and efficient transportation for a wide variety of material,which make them very popular in the material handling and packaging industries. Many kinds of conveyor system are available,and are used according to the various needs of different industries. Stable running, good quality, maintenance free. Small vibrating and long lifespan.The flexibility of sealing methods. High accurare steel pipes ensure the rollers with low vibration and noise. 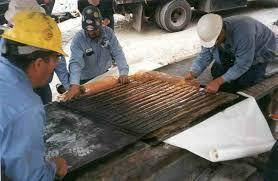 Conveyor belt splicing is the process of joining together two pieces of conveyor belt. Usually, this is done to either elongate the original conveyor belt or to repair a torn or damaged conveyor belt. Because there are so many industries in which conveyor system are employed, there are many types of conveyor belt and components. In order to correctly splice a belt,the type of belt,speed of conveyor belt system,materials traveling on the belt and conveyor belt environment must be taken into account.